By Levers Optical Co. Ltd. Stores Ref. 22c/111 (Goggles), 22c/113 (Screen, Anti-Glare). 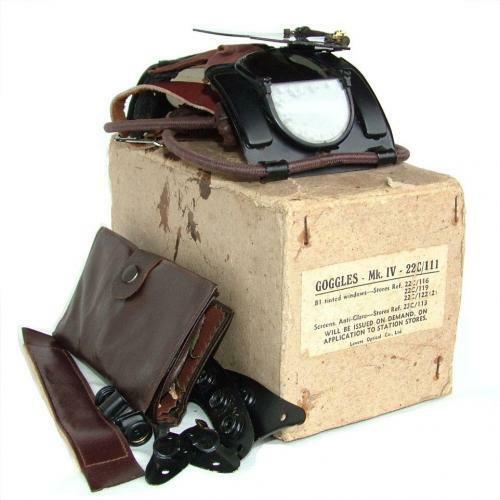 The first of the MK.IV series goggles. Manufactured with a black painted pressed brass frame incorporating hinged lens holders. With this pattern the lenses fit directly into the goggle frames without the need for sub-frames around them. The goggle frame is in excellent condition with very little paint loss or rubbing. The leather nose-piece and chamois backing are both very good but the rubber pads have gone hard as usual. Fortunately they do still retain some shape and haven't deteriorated as much as many seem to. All strap components are excellent, the leather section has manufacturer, Air Ministry and reference marks. The tinted lenses have some delamination marks but display well. Finally there is the anti-glare screen, commonly known as the 'flipshield'. This example has the rare long exposed type spring mechanism and is in excellent condition with very little scratching. The goggles come in the original issue box complete with accessories wallet containing some spare tinted lenses in their paper sleeves (some delamination, one cracked), 'Everclear' antidim tube, full set of copper rivets and spanner. The box also contains a complete set of helmet plates and poppers for attaching to the Type B or C-type helmets (all very good to excellent) and the leather/chamois forehead strip too. Overall this is a 'very good '+' used' set of goggles. The MK.IV is considerably rarer than the MK.IVB and this is reflected in the price. Ideal for a Battle of Britain display. Stock code G20595.